I Need A Luxurious Car For Cruising That's A Little Offbeat! What Car Should I Buy? Amanda is a doctor who has soldiered on with a 2000 Chevrolet Monte Carlo that’s come to the end if its natural life. It’s time for her to treat herself to a nice coupe that can handle long distance cruising, but she doesn’t want a typical “doctor’s car.” What car should she buy? It doesn’t seem like doctors drive awesome cars anymore. I’m sure most of the younger ones right out of school are still saddled with massive student loan debt. Not long ago, I was treated by a young doctor who was daily-driving a 2007 Scion tC. I kind of felt bad for him. But doctors in Amanda’s area are living the good life, and now it’s her turn to get something she will really enjoy. 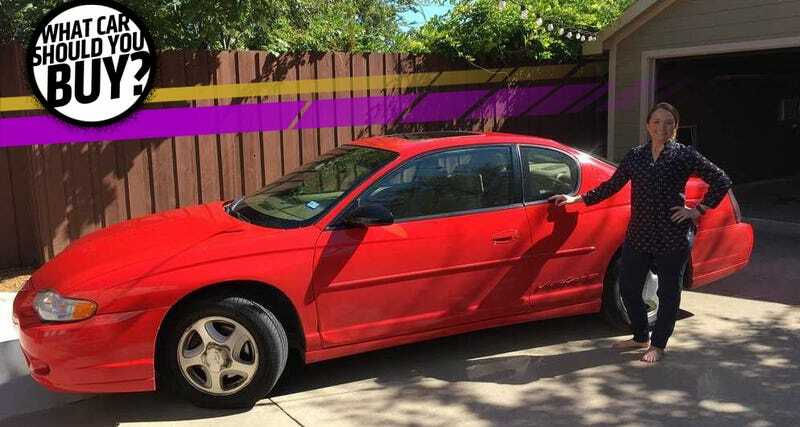 My wife is looking for a replacement for her 2000 Monte Carlo SS with 165k miles on it. She’s had the car since 2002 and loves its looks and the way the engine sounds in the passenger cabin, as well as its reliability. But last year part of the transmission case wall broke apart and the metal pieces damaged the planetary gears to the tune of a $3,000 rebuild, and other parts (though not the engine) are starting to wear out as it reaches old age. We’re tired of the constant maintenance and want to upgrade. We live in Dallas, the land of G-Wagens, Range Rovers, and M3s. Also, she’s a doctor and would like to avoid the “Dallas doctormobile” stereotypes of a late-model-year Porsche or Corvette. In other words, she’d like something a little offbeat. She’d like something that isn’t on the steepest part of the depreciation curve but reasonably recent. It doesn’t need to baby (for a few more years) and will mostly be a daily driver, but will be used for annual trips to West Texas/New Mexico to visit family. I can handle light maintenance but having had an issue a month for some time now it would be nice to have something that breaks infrequently—expense is less of a concern as long as we can go long periods without having to take it into the shop. Finally, we discovered that our driveway is exactly one Monte Carlo in width, so we would need a car no more than 74 inches wide. Now if you really want to live a little, throw some caution into the wind and find the nicest Maserati Gran Turismo you can for under $50,000. Why the Maserati? Because you need a grand touring coupe and it says it right there in the name. It also looks and sounds amazing. You get all the benefits of an Italian exotic without the harshness and impracticality. Of course, with an out-of-warranty Maserati, you also have to deal with Italian exotic maintenance. But this isn’t a car you keep for a long time—this is a car you enjoy for a year or two, and dump it before it becomes a money pit. Then you can brag to your kids how you owned a Maserati and show the other doctors in your practice what a real baller looks like. If the Maserati idea sounds like too much of a gamble, a more reasonable, but still awesome selection would be the all-new Infiniti Q60 coupe. Infiniti is a great alternative to the German choices. The Q60 has a starting price of only $39,000 for a four-cylinder turbo model, though you will want to pony up the extra cash for the V6 turbo starting at $44,300. At that price point you will get luxury features galore, a comfortable yet sporty ride, and with 300 horsepower, you will have a bit of fun too. The best part is that you’ll get all that under a full warranty. If a convertible is more your thing, you can find plenty drop-top examples of the previous-generation Q60 with low miles for around $35,000. I was literally rubbing my hands together as I read your email. You want something sporty, luxurious, not too flashy, sounds nice and is a coupe for under $50,000? My god, that’s like telling me that I have the run of the candy store. There is a lot to choose from with those parameters set down, but in the end, I’d recommend an Aston Martin V8 Vantage. Besides being a staff favorite around these parts, the V8 Vantage has simplistic and timelessly good looks that will definitely set you apart from your Porsche- and Corvette-driving contemporaries. The interior is spacious and comfortable, especially for a coupe, and there is a handy little cubby behind the seats that is good for a small bag or purse. Everything is wrapped in leather, so the luxury doesn’t end just because you’ve climbed into the car. The V8 Vantage is classified as a grand-touring car, so comfortable and long trips are its MO. At 73.4 inches wide, it will fit in your driveway. You also talked about how sound is a factor as well. Look no further. Many V8 Vantages fall right in between the $40,000 to $50,000 range. If you want something more understated, you can always go with a silver, gray or black one. Here is a lovely burgundy example with just 24,000 miles for $49,999. A lot of broke car enthusiasts moan that their favorite perfect old cars have been “discovered” and prices have soared out of their meager means. That’s a bummer for broke college kids trying to buy that old Porsche on the leafy side of town, but it means that there are tons of really wonderful, restored classics in your price range. You live down in American Car Country, so most of the extremely clean, sorted old builds around you are from Detroit. Big Buicks, bigger Chevrolets, that sort of thing. They’re wonderful cars, simple and easy to own, but I think there’s something more interesting you could spring for. These are Mercedes’ 1960s convertibles and they’re absolutely beloved for representing a pinnacle of build quality everyone talks about but never experiences with German cars. A new Mercedes is plastic. A Pagoda SL is the real deal. Over-restored examples going at feverish auctions are above your budget, but it’s not hard to find good looking cars you’re not afraid to drive on the regular within your price range. Here’s a ‘69 for $42,900. I’d go look at it if I had the means. You’ve already got a GM product that has served you well for over a decade, so why fix what ain’t broke? Also, all the other cars on this list are total doctormobiles. Really, a Maserati and an Aston? A vintage Mercedes? You might as well paint a red cross on these things. What you need is a Cadillac ATS. If you can swing it, go for the high-performance ATS-V. I just drove one 1,000 miles last month, and fell in love with the speed (zero to 60 in 3.8 seconds! ), amazingly comfortable Recaro seats (I spent a night in them), and handling that could easily keep up with the Aston or Maserati. It’s also narrower than 74-inches, and, as long as you don’t get it in red, ain’t really that flashy. Plus, it’s definitely not a car you see everyday, so you don’t have to worry about driving a typical doctor’s car. Of course, the problem is that this car is only entering its second model year, so getting one for less than 50 large is going to be tough, even though discounts on these are extremely common. I’ve found one for close to that figure near you, but it’s a sedan, and it’s bright red. But you can find standard V6 ATS coupes—also fairly quick and comfortable—for well below what you want to spend. Here’s a gorgeous white one for just under $30,000. That’s a great deal. I Have Porsche Dreams On A Honda Budget! What Car Should I Buy?